A man loves his pet parrot so much that he took extreme measures like body modifications just to look like it! Ted Richards, a retired shoe factory worker, had his eyeballs and face tattooed to look like Ellie, Teaka, Timneh, Jake and Bubi - his favorite pets. He thinks that what he did to his face and body is really great and he love it. He explained that it was the best thing that has ever happened to him. He added that can't stop looking in the mirror because he was so happy he thinks its unreal. The 56 year old parrot man was from Bristol England. He bravely concurred a six hours operation in the pursuit of his parrot dreams. 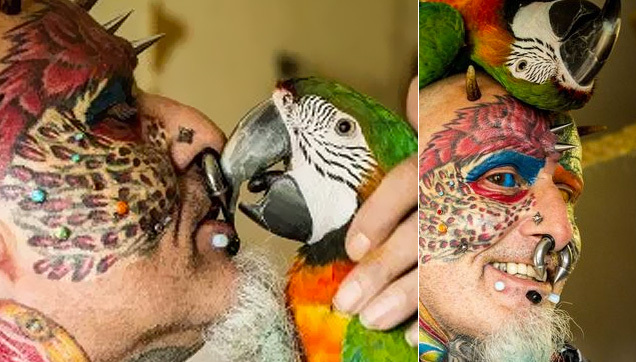 He also had his tongue split, had 50 piercing and over 110 tattoos thinking that it will satisfy his obsession with his favorite feathery friends. Ted Richards denied the fact that the reason why he did extreme body modifications was because when he was younger her was teased about his ears. The only issue he had is how he will keep his glasses in place but he find out a solution for it by attaching two small metal pins on both side of his head. However, Ted the parrot man, seems to still be not satisfied with his transformations. He is, in fact, searching for a surgeon who can modify his nose into a beak. He thinks this will fulfill his flight of fancy.